What are the results? Well, all of the usual audio checklist virtues: significantly better overall transparency, reductions in "digital glare," even on the oldest not-too-good-sounding CDs. Small but valuable gains in soundstaging, with a greater sense of the sound being detached from the speakers. (That is a virtue with my Analysis speakers anyway, but the Digital further enhances that quality.) Low-level detail is enhanced, in a natural, non-spotlighted way. Most importantly, the music simply sounds less "canned" — livelier, more immediate, more involving — the kind of instinctive gut-level response that I have experienced more typically with analog than with digital playback. It works great with DVDs as well. Even with my poor eyesight, it is easy to see the better color saturation, improved contrast and deeper blacks coming through my Oppo blu-ray player to my 60-inch Sony flat screen. $99 for this little bottle seems a bit steep. But a bottle goes a long way, especially if you treat your discs one application at a time. I've already been through a couple of bottles, but each one lasted months, and I play a lot of discs. Given the sonic improvements — clearly better than any other spray-on CD treatment I have ever used — AUDIOTOP Digital is worth the money. 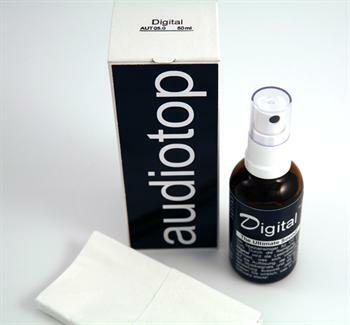 In tandem with my Auto Desk CD lathe, this nifty spray is now an essential part of my preparation to play any little silver disc.